They were standing by the edge of the highway when she caught the unmistakable sound of a Harley suddenly slicing the deep silence that surrounded them. The V-twin engine was howling and the rider coming on fast, even faster than the one that’d aimed for them at the Ice House. In a twisted way, the motorcycle’s speed was also reassuring. There was no way the blown bike could stop; supercharged motorcycles defined the word speed. Whoever it was, a replay of the other night was not in the works. The rider would have crashed the bike had he tried to halt its progress in time to stop beside them. Without thinking, she took a step back from the pavement. At the same time, King whipped his ticket book from his back pocket. They had to have a reason to be seen together, and a speeding fine was as good as any. A blur topped the nearest rise. If she had to guess, she would say the motorcycle was passing the 120 mph on the gauge, maybe more. The driver and rider both wore helmets, but that wasn’t going to help them if they had to eat asphalt. With an almost surreal speed, a blue Harley dipped over the horizon and screamed by. If she hadn’t seen a couple of dry bushes shaking from its passage, Jessie might have thought she had imagined the whole thing. The smell of hot exhaust reassured her that the motorcycle had been for real. It would have been a difficult task, if not an impossible one, to catch up. Cursing and wondering if she should try regardless, Jessie started to walk back onto the pavement, but she stumbled over the asphalt’s crumbling edge. King instantly reached out to steady her. The warmth of his fingers against her elbow rippled up her arm and headed for her chest, her pulse accelerating faster that the motorcycle that had just passed. She wasn’t prepared for the reaction. Or for what happened next. King didn’t release her. His gaze darkened. Her heart raced. And without a single second’s warning, their lips came together. It wasn’t a kiss that they shared; it was an explosion. The same kind that had brought them together the first time. Memories of that night rolled over her as King’s mouth covered hers. His hands, rough in their neediness, yanked her against him and she melted into his arms, her desire suddenly rising under the hot Texas sky. She didn’t know which sensation to concentrate on first; his lips, his touch, even the smell of his skin. Each demanded its own reaction, and her body took over, her own hands feverishly pulling him to her . She had dated plenty of men and bedded more than one but nothing she’d experienced could compare to what she shared with King the one night they’d been together. As they kissed on the dusty side of a lonely west Texas highway, she suddenly remembered why she felt that way. And now a few words from author Kay David. 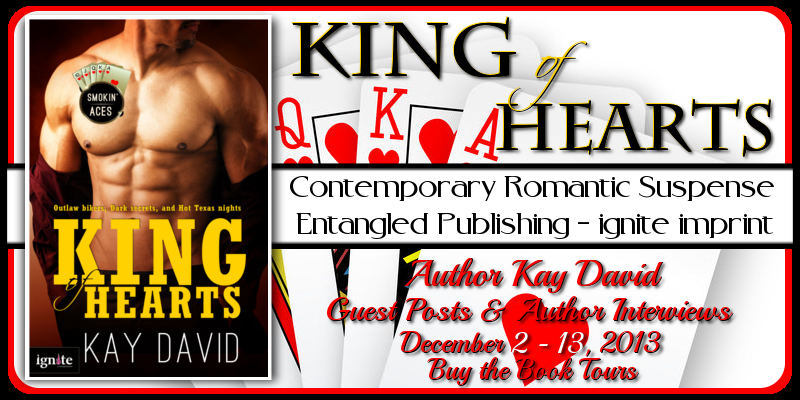 King of Hearts is my latest Entangled Ignite and I’m giving my readers a taste of what happens before the book opens. If you’ve follow the entire blog schedule you’ll know that Jessie Delacourt and Kingson Landry are reaching a critical point! 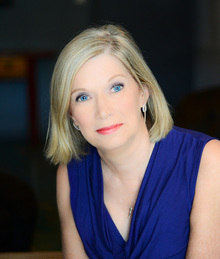 I’ve posted my schedule on my website, kaydavid.com and at buythebooktours.com. Don’t miss any of them! I’m giving away a great pair of earrings if you leave a comment. Jessie wanted King more than she wanted to breathe. She knew she shouldn’t make love with him. King was more than just a deputy in Rio County, which was bad enough, he was a man with secrets. She wasn’t sure how she knew this, but it was the truth. Coming to the bar tonight suddenly seemed like a really bad idea. But nothing could shatter the private world of desire that cocooned them. They had hardly spoken to each other, barely danced. Before she stop herself, she’d let him pick her up. Her legs had tightened around his waist and now her arms were wrapped around him, holding on in the storm that consumed them. Their mouths searching, their hands caressing, a dance of a different sort took over, destroying what little control she had left. Jessie told herself to stop, to gather herself and remember who she was and why she was there. What they were doing was dangerous. Crazy. Reckless. Too late. The need King had unleashed inside her couldn’t be ignored, even if it threatened her entire reason for being in Rio County. King’s hands, tucked beneath her hips, yanked her even closer to his body, his mouth seeking more. Their tongues met then his lips dropped to her neck. Gentle nips turned into bites that took her passion to a level she’d never been before. She was scared and felt reckless and didn’t give a damn what came next. No man had ever made her feel this crazy. As he pressed her against the truck, she acknowledged the fact that nothing mattered to her in this moment except having him and taking him and then doing it all over again. He fumbled behind her and pulled open the door. A moment later, Jessie found herself inside the truck and King climbed in behind her. 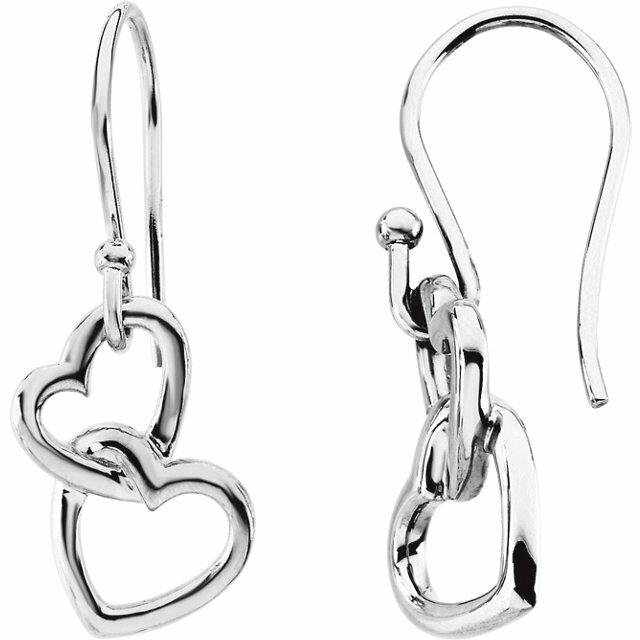 Giveaway: A beautiful pair of sterling silver earrings that are very similar to a pair that plays a pivotal point in King of Hearts.